Add eggs to a pot with water. Bring to a boil and cook for approx. 8 min. or until hard-boiled. Meanwhile halve and peel avocados, remove the pit and dice the avocado flesh. Wash and finely chop cilantro. Rinse eggs under cold water, then peel and finely chop eggs. Transfer to a large bowl and mix with diced avocado and cilantro. Juice the lime and season egg salad with lime juice, mustard, salt, and pepper to taste. Mix everything well. 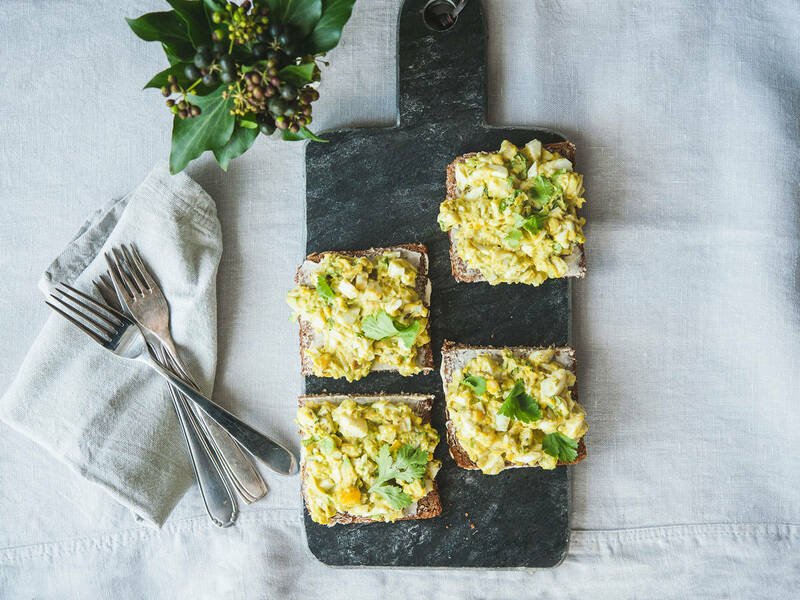 Slice bread, coat with butter, and top with egg salad. Garnish with cilantro and enjoy!